Her story was used to help young people relate to economic and life choices they while soon face. It’s RISKY BUSINESS, but it is each individual’s choice. We are all FREE to ENTER into any business or investment to gain the PRIZE– personal profit; hence the term FREE ENTERPRISE. Moran, Karen Board. “Risky Business”. Women’s Unlimited Magazine, March 1998 (19). As Mrs. ALJS her mother began writing articles for the Louisville Courier-Journal to support the family. As a widow with four children Annie Smith moved the family first to Texas and then Ohio. There was an economic depression in the country during this period. Edna’s teachers praised her stories and poems. She wanted to go to Vassar College, but was ill and the family had little money. Holden collection, Schlesinger Library. She decided to attend the Cincinnati Phonographic Institute to learn stenographic skills to record meetings, legal and court matters and business affairs. She learned the Pitman shorthand method and how to use the typewriter (invented in 1868). At the time women were not permitted to sit in courtrooms and take down testimony of witnesses for fear their feminine sensibilities would be offended by the rough language that was used sometimes. Women were only allowed to transcribe the testimony. In 1889 with two years experience males could earn $20 a week while females could earn $15 at a “clean” job. “Difference in salaries is much less than usual…not for stupid or lazy people…a stepping stone to another business for men, while women stay or marry.” Male teachers only earned $33 a week to females $13 in 1890. By 1910 80.6% of all stenographers and typewriters were women. 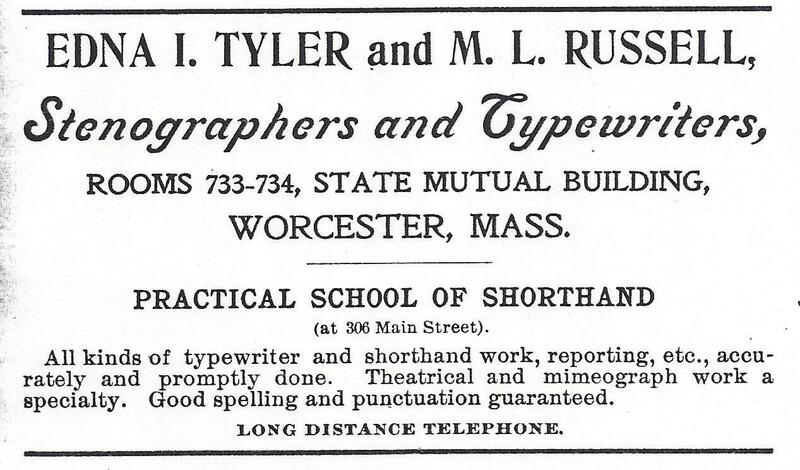 “Practical Hints to Stenographers and Typewriters”. Business Woman’s Journal. January 1889 (18). Riley, Geraldine. Inventing the American Woman. Arlington Heights, Il: Harlan Davidson, 1987 (167-171). “Woman As a Business Stenographer”. Woman’s Journal. 11 July 1885 (18). When Edna was twenty-three, she married Erastus D. Tyler wearing orange blossoms in her hair from his Florida orange grove. However, her baby and husband died within a year. What could she do? Was is just going to wait for her life to move along or take charge of her path? She lived in New York City where competition was stiff for stenographers. Edna wrote to a young lawyer friend in Worcester, MA, but he didn’t encourage her to move even though the closest public stenographer/typewriter to this county seat city was a train ride away in Boston. Edna would have agreed with Sarah Breedlove Walker, an African American who created her own cosmetics line) who said, “I promoted myself. I had to make my own opportunity! But I made it! Don’t sit down and wait for the opportunities to come. “Business”. Women’s History. Spring/Summer, 1996 (44). 1886 Worcester Directory. Worcester: Drew Allis, 1886. 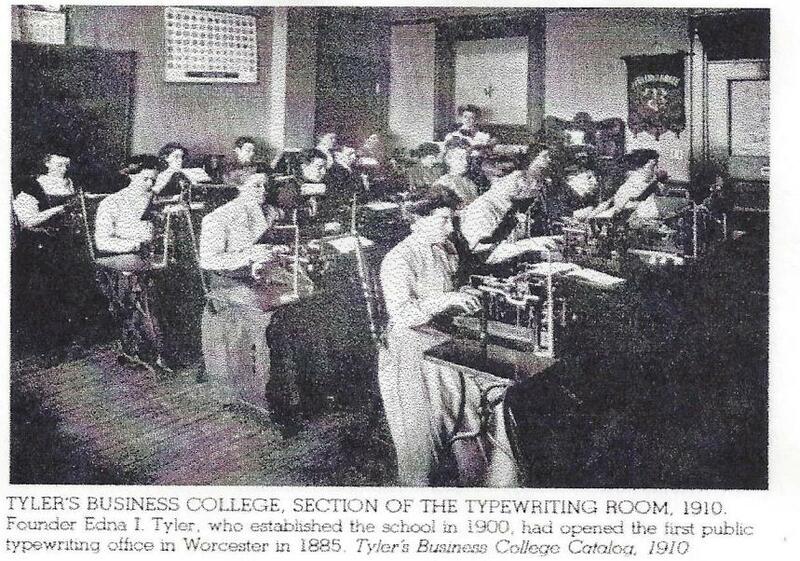 Establish the first public stenography/typewriting office March 4, 1885 in Worcester just ten years after Mr. M. A. Saunders of NY became the first typewriter woman in the world. Just the year before H.R. Cummings began selling typewriters in town. “Typewriter 20 Years”. Worcester Telegram. 29 January 1905. Earn a law degree from Lincoln-Jefferson University so she would be a better legal recorder. In 1897 Addie Gillette passed the Massachusetts bar and was admitted only after a fight against the women of Fitchburg for being an educated “loose woman” to become the first female lawyer in Worcester County. Stephanie Grant was the first Worcester woman admitted to the bar in 1908 Grant served on the school committee in 1911 and was president of the Association of Collegiate Alumnae (AAUW) in 1912-1913 before marrying and moving to New York. Southwick Albert. More Twice Told Tales of Worcester County. 1994. 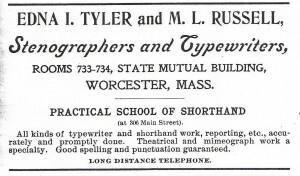 Found and be president of the Worcester County Stenographers Association with both male and female members who met alternate Tuesdays at 10 Burnside Building in 1887. Worcester Directory. Worcester: Drew Allis, 1887. 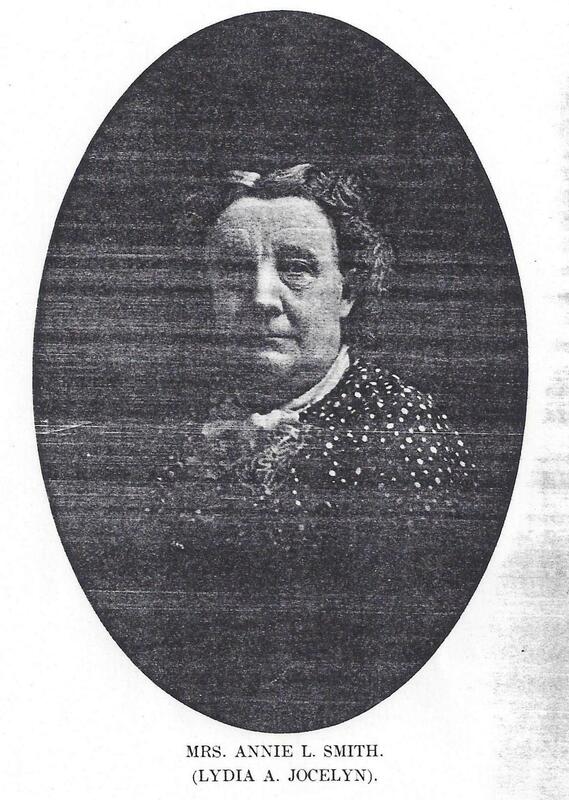 In 1888 Edna, her mother and Lena Coxon also found The Order of the Royal league of the star and Crescent. Repair her own machines and poured her own discs. She and a friend built a machine like a Dictaphone for hour-long dictation. Holden, Geraldine Weston Dudley. Holden Papers, Schlesinger Library. Tyler’s two-sided Business Card [n.d.]. Courtesy of Schlesinger Library. Tyler’s Business College Ad. Courtesy of Schlesinger Library. 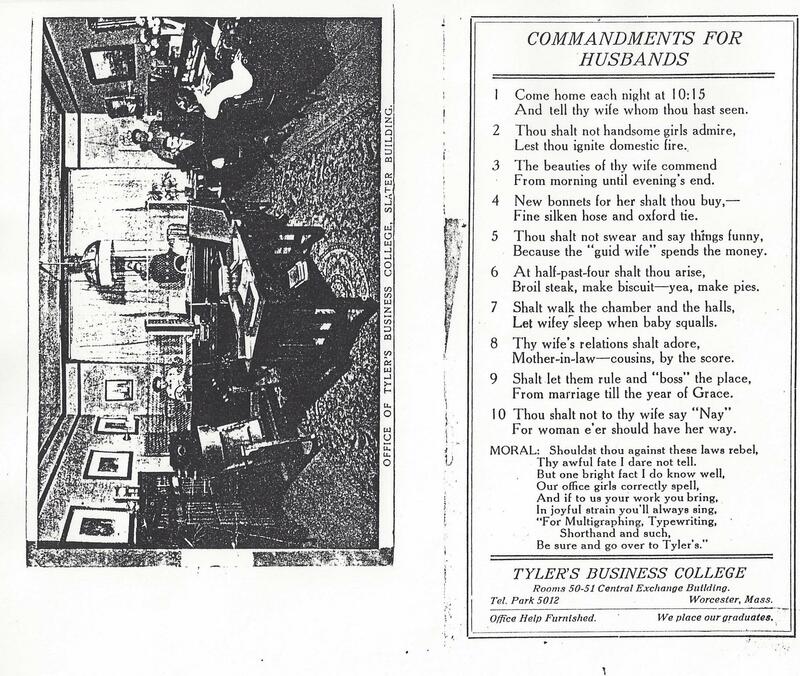 Establish Tyler’s Business College in 1900 after hurting her right hand. This was the first of its kind. In 1900 over 75% of all clerical workers were females (up from just over 3% in 1870). By the 1920 clerical workers were known as “Girl Fridays” (term from Defoe’s Robinson Crusoe). “Women in the Workplace”. Women’s History. Spring/Summer, 1996 (24). 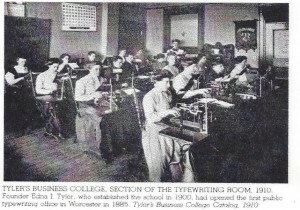 1910 Tyler’s Business College “Women in the Workplace”. Women’s History, Spring 1996 (24). Publish her mother’s novels written under the pen name of Lydia A. Jocelyn, like The Black Mask; or Bonnie Orielle’s Lovers. Edna and her mother lived and worked in Worcester where they wrote and staged many pays together. 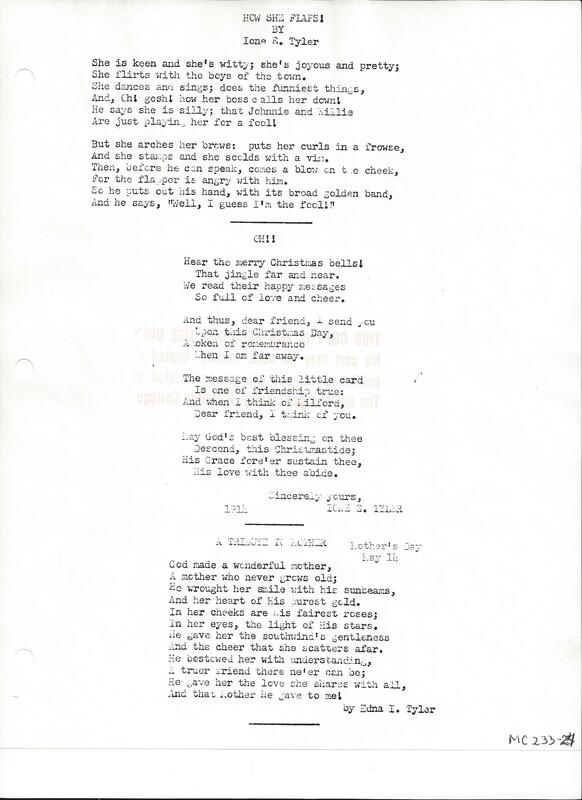 Edna wrote many poems, music and stories. 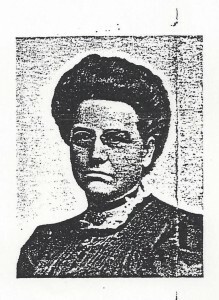 Her sister Gertrude Aglae Smith Dudley also taught at Tyler’s College. Gertrude’s daughter Geraldine Weston Dudley Holden is responsible for giving the Schlesinger Library her ancestors’ archives which provided the basis for this lesson. 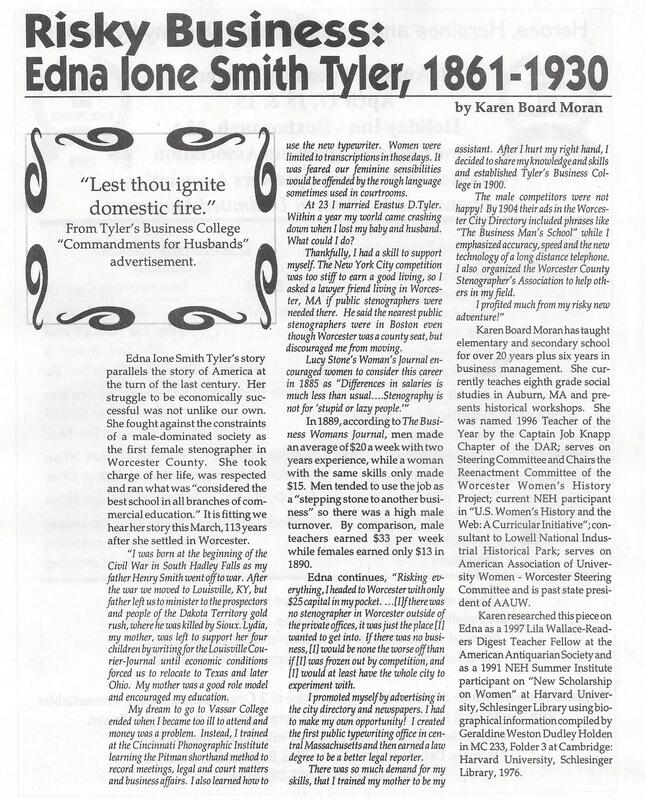 Resources to bring Edna Tyler back to “life” were found during a 1991 Harvard Graduate school of Education National Endowment for the Humanities Summer Institute: New Scholarship on Women, Schlesinger Library, Cambridge, MA and a 1997 Lila Wallace-Reader’s Digest Teacher Fellowship, American Antiquarian Society, Worcester, MA. The eighth grade students of Auburn Middle School, Auburn, MA contributed in shaping the use of her voice in the classroom for almost fifteen years. 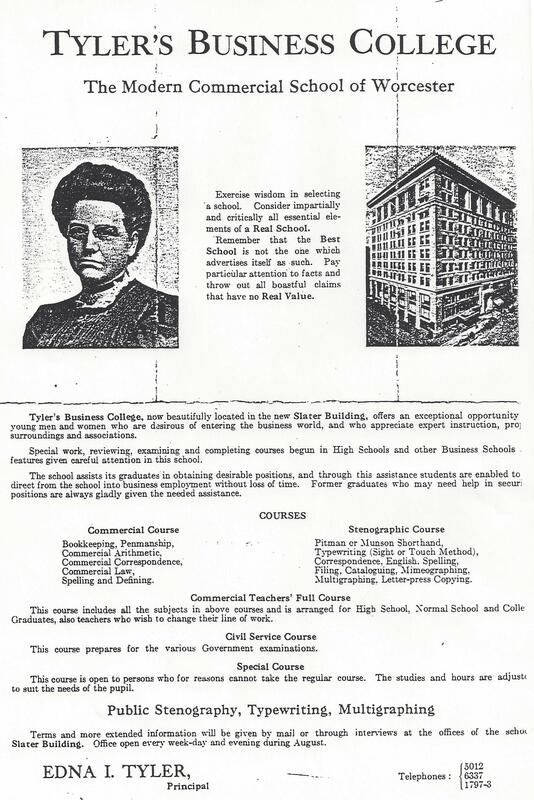 The “Risky Business: Edna Ione Smith Tyler” Lesson was included in the resource binder created for “Dinner with the Dead ladies: Reviving Women’s History in the Classroom” by the Worcester Women’s History Project in 1998. 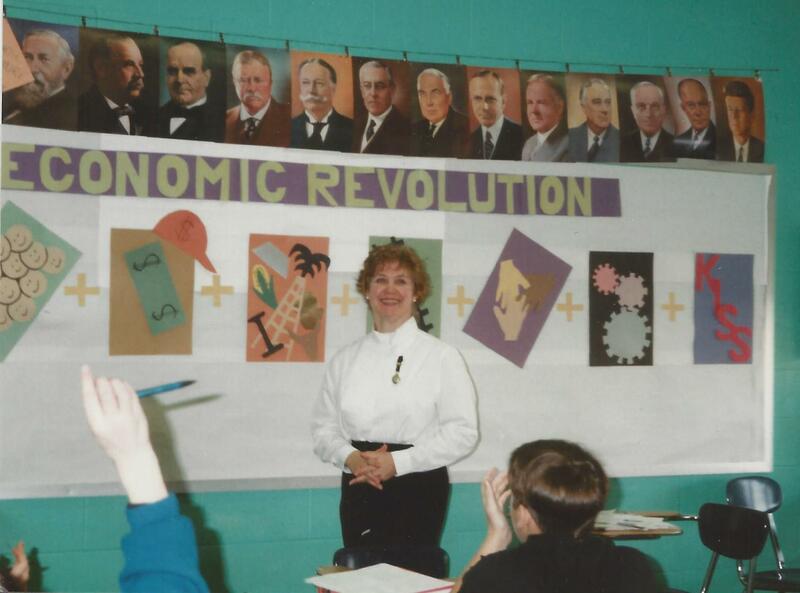 Edna was used in conjunction with Moran’s “Taking Stock” Unit–a simulated economic unit based on forming a corporation, working for the corporation and playing the stock on “Wall Street”. Moran, Karen Board. 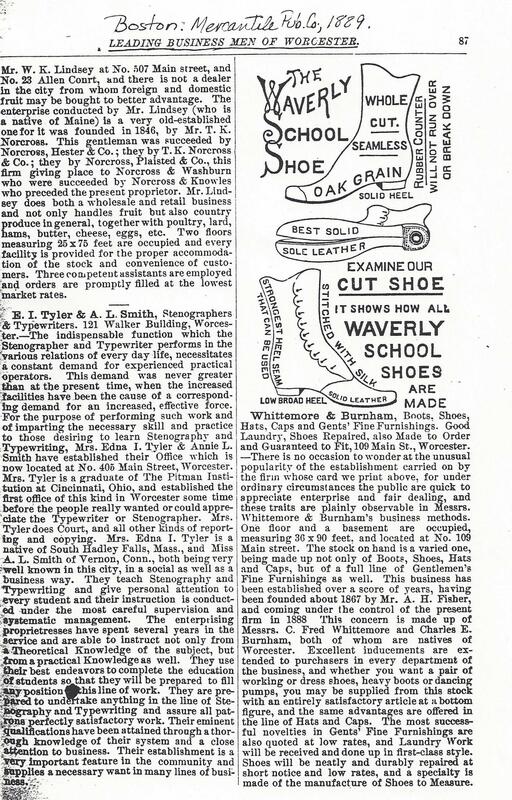 Worcester Directory Ads and notes between 1885-1905. Crane, Ellery Bicknell. Historic Homes and Institutions and Genealogical and Personal Memoirs of Worcester County, Massachusetts: With a History of Worcester Society of Antiquity, Volume 2. 1907 (393). Leading Business Men of Worcester. Boston: Mercantile Publishing Company, 1889 (87). 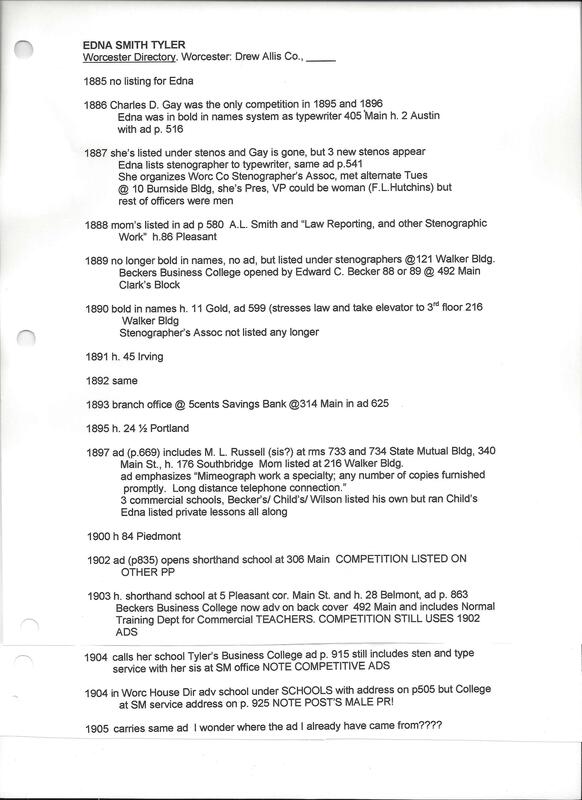 Smith, Tyler and Holden Family Papers. Worcester Historical Society. Worcester, Massachusetts. 3 manuscript boxes, oversize manuscript box, and “If it Meant Your Bread and Butter”, unpublished biography by William Klingshirn. “Typewriter 20 Years”. Worcester Telegram, 29 January,1905.